Of all the massive game franchises that dominate games consoles generation after generation Assassin’s Creed has to be one of the most unique. Written by Game Informer’s Matthew Miller, Assassin’s Creed: The Complete Visual History is a new book from Insight Editions that sets out to take a deep dive into the mythology of this franchise in its many forms. 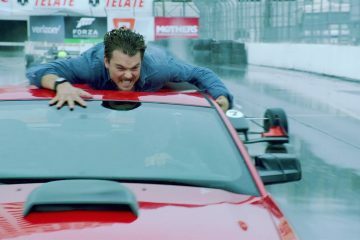 Before we dive into the review itself it’s worth going over the premise of the game series, which is pretty bonkers. It’s an open world platform game that focuses on stealth, accomplishing missions, and (you guessed it) assassinating people. You play as Desmond Miles, a descendent of a long line of assassins that has gone up against the Knights Templar for several generations. You finally agree to work with the Assassins and use something called the “Animus” to experience your ancestral memories, find artifacts, discover the secrets of the “First Civilization,” and unite humanity once and for all. Oh, and you have a great time doing it. The free-roaming aspects of the games are a big part of what makes the Assassin’s Creed franchise work. For that reason, Assassin’s Creed: The Complete Visual History goes out of its way to explore the process behind creating those open worlds. For instance, when talking about Paris as a setting for Assassin’s Creed: Unity he quotes Art Director Mahammad Gambouz as saying “As we did the research, we found that Paris has so many historical layers that we thought we could add other eras.” As the interview continues Gambouz explains how these different eras were inspired by movies such as Inglorious Basterds, Moulin Rouge, and The Messenger: The Story of Joan of Arc. In turn, each era has a new series of “visual assets” that couldn’t be recycled from game to game, so creating these worlds took legitimate work. Fascinating stuff. The characters then take center stage, with a veritable gaggle of period inspired personalities and amazingly detailed outfits. 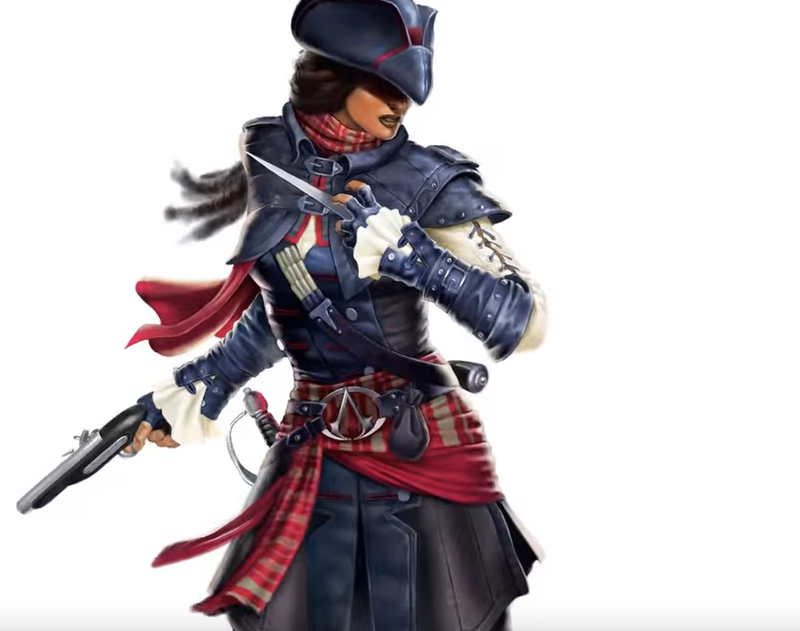 One stand out is Aveline de Grandpre (above) who appeared in Assassin’s Creed: Liberation, which was a DLC add-on for Assassin’s Creed III. She is the daughter of rich shipping magnate and his former African slave. When discussing the character, Miller writes “Aveline’s background as both a woman and person of color were an important step for the franchise; the new character perspective invited creative opportunities for writers and artists alike.” Given the current push for strong female characters, it is nice to see that the Assassin’s Creed team was reaching for diversity back in 2012. As a lover of books, and particularly “art” books, this thing is very fun to hold. It’s a large hardcover book that is taller and longer than the average magazine. The paper is very high quality and the images are spectacular. 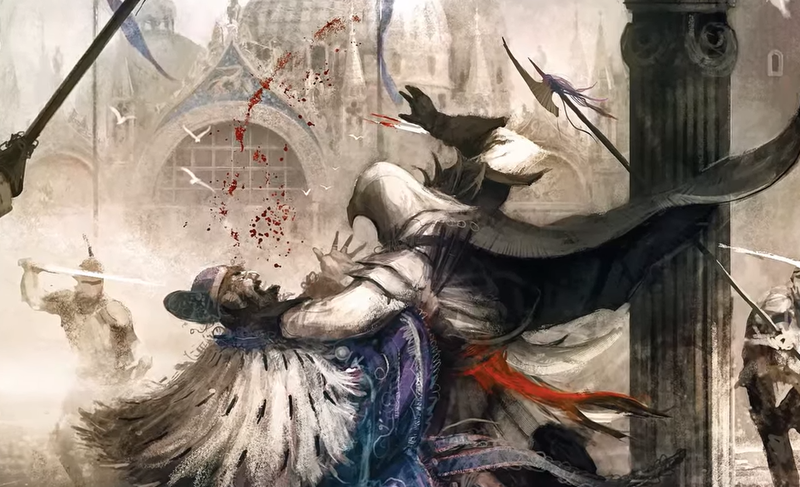 You see concept drawings of assassin’s in all their forms — jumping, flying, and doing clandestine things. The settings, or course, are featured in large splash pages. You get to see deserts, Crusade’s era Jerusalem, Renaissance Italy, America during Colonial times — the list goes on and on. There is even a special section dedicated to the First Civilization and the concepts and designs behind it. So, is this the Assassin’s Creed book for you? If you are a long time fan of the franchise and ache for the next installment then…yes, do pick this up. I was pleasantly surprised at the level of in-depth coverage this book supplies and can say I actually learned something. If you are looking for a gift for someone who loves the franchise, this could also be a stocking stuffer for that special someone, as the holiday season is fast approaching. Also, if you are an aspiring artist that just wants a glimpse into the gaming industry and what goes into creating these big budget games then this could be an educational experience. Few books about games go this deep and feature this much art to fawn over, so this time around I think Matthew Miller hit a homerun. It will be fun to see what the Assassin’s Creed franchise has in store for us next. 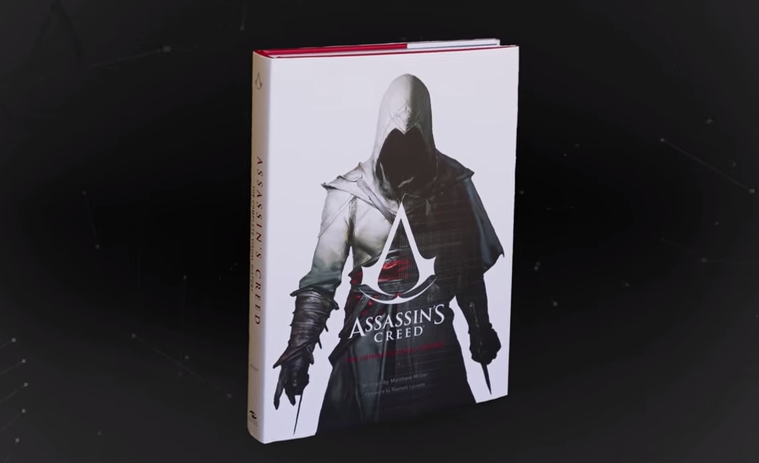 The book is available now through most retailers in the U.S. For international fans of the franchise, Assassin’s Creed: The Complete Visual History will be published by Titan Books in the UK, Panini Espana in Spain, Panini Verlags in Germany, Duku Cultural Exchange in China and Editions Larousse in France. Next Article'SCOUTS GUIDE TO THE ZOMBIE APOCALYPSE' CLIP: "ZOMBIE STRIPPERS"